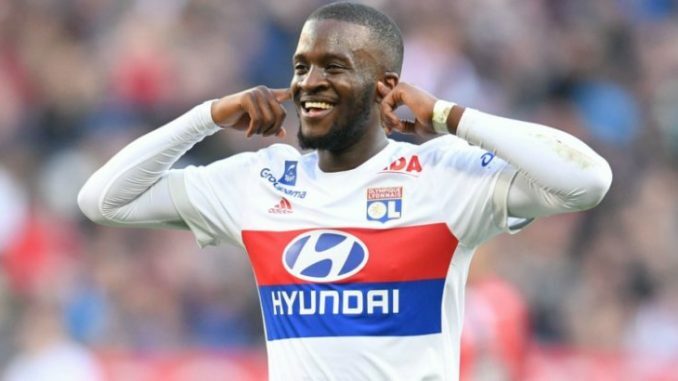 Manchester United and league rivals Manchester City are both closely monitoring Tanguy Ndombele’s progress at Ligue 1 side Lyon, according to reports in France. The powerful midfielder, who starred in Les Gones’ opening-day defeat of Manchester City in the Champions League group stage, previously revealed that he was the subject of a failed offer by the Blues in the summer. Pep Guardiola is known to be on the observation post for a long-term replacement for Brazilian Fernandinho in the heart of the Citizens’ midfield after missing out on the Barcelona-bound Frenkie De Jong. While Manchester United’s midfield options were reduced in number by Belgian star Marouane Fellaini’s move to China at the end of the January transfer market. Tanguy broke into the French national team at the beginning of the campaign, making four appearances to date, and Le10Sport claim that it would take a fee in the region of €80m to prise the 22-year-old star away from Ligue 1’s third-placed side. That would represent a club-record sum for the Blues, and Manchester United’s third-most expensive signing, but the defensive midfielder could have been plying his trade in the EPL already, had Lyon not been so interested in keeping their most valuable asset.